This article shows you how to Install and Configure OpenStack Nova Services. In the previous post, we have covered the topic, how to install and configure the Glance component for the Image service which was also a part of the Openstack Deployment. Continue with the previous post, we will explain you how to install and configure Nova components on node1 and node2. Basically OpenStack Nova Compute allow us to host and manage cloud computing systems. OpenStack Compute is a major part of an Infrastructure-as-a-Service (IaaS) system. OpenStack Nova Compute interacts with OpenStack Identity for authentication, OpenStack Image service for disk and server images, and OpenStack dashboard for the user and administrative interface. 4. Stop the firewall to avoid issues during the installations (systemctl stop firewalld ; systemctl disable firewalld). 5. Make sure your nodes supports virtualization. If you get value of equal or more than '1', then our node supports hardware acceleration. If not we should use Libvirt to use QEMU instead of KVM. Login into 'node1' to create the Nova Database to store its data. Replace 'node1' with your controller node name and replace 'redhat' with your Nova password you wish to set. Do the following changes on /etc/nova/nova.conf file. Replace 'redhat' with your nova password which we have set during the nova database creation and replace 'node1' with your server name. Replace '100.73.168.190' with your server management IP. Replace 'node1' with the servername where you have configured rabbitmq service. Replace Userid and Password of rabbitmq service with your credentials. Replace 'node1' with your keystone server name and replace 'redhat' with your nova password. Change the following parameters under [vnc] section. Change the following parameter under [glance] section. Replace 'node1' with your glance server name. Change the following parameter under [oslo_concurrency] section. Start and Enable the nova service. Source the admin-openrc.sh to load the environment to gain access. Create the nova user and add roles. We have completed the Installation and Configuration of Nova Controller component on node1. Lets do it on Node2. Install the Nova Component packages. Replace '100.73.168.191' with your server management IP. Check our server Node2 supports virtualization or not?. Edit /etc/nova/nova.conf and change libvirt section as below. Login into each node and source admin-openrc.sh script. We have not created any admin-openrc.sh script on node2, Soo just copy from node 1 server. Execute the below command to ensure each nodes are available in the list. You should see the list of services configured with number of nodes connected for this NOVA service. We have installed and configured NOVA Compute service on Node1 and node2. 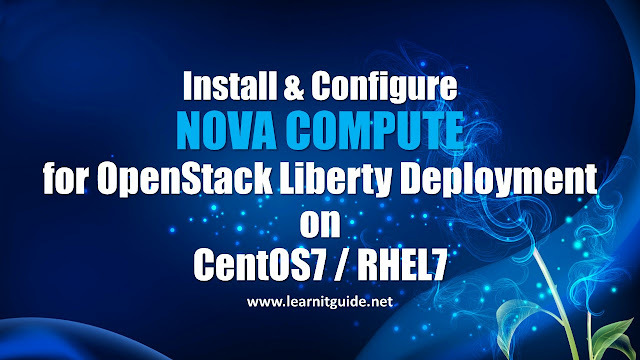 Refer the below links to know the stages involved in this OpenStack Deployment.